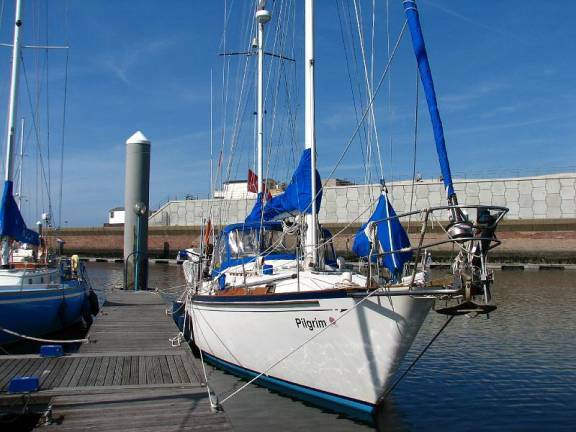 Pilgrim was launched at Fox’s Marina in Ipswich on April 9. 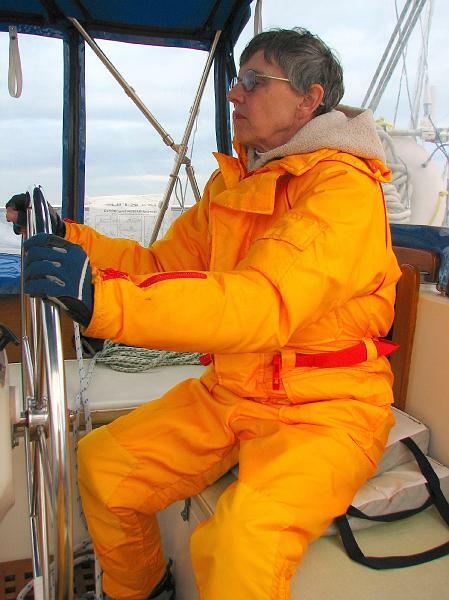 She did well “on the hard” over the winter while we were in North America (December – February) and during our motor tour visiting sailing friends in southern England (March). The northeast winds howled and we were showered with rain and ice pellets during the first three weeks of April. 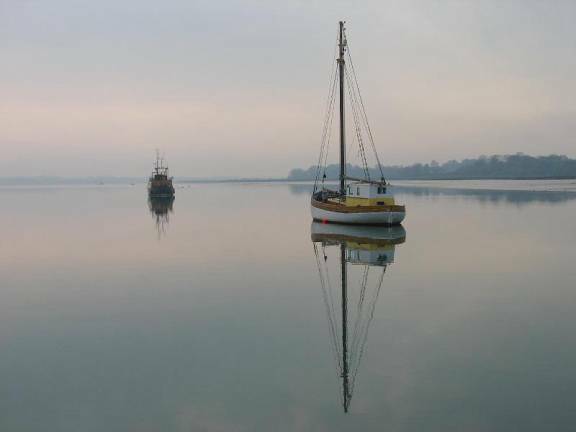 We anchored the boat in the River Orwell off Pin Mill for a week waiting for a weather window to cross the North Sea to Holland and enjoyed the Oystercatchers’ serenade. 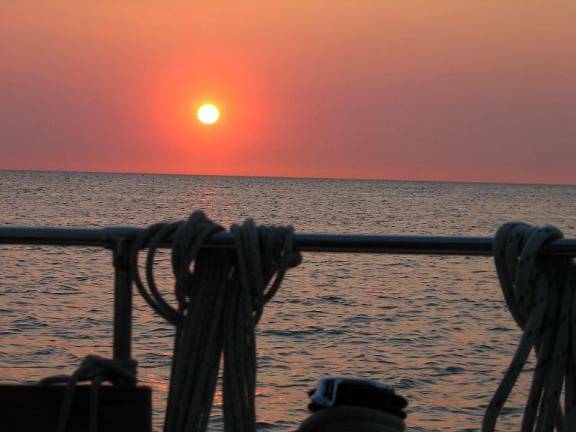 The wind finally calmed down, and we set sail towards the northeast for the 150-mile (overnight) journey across the North Sea. After motoring out the shipping channel, the wind was perfect for a broad reach due east, keeping south of the shipping lanes. The orderly lanes through the Straits of Dover became somewhat chaotic to our eyes. Commercial ships popped up in areas we hardly expected; sometimes they seemed to be on the incorrect side of navigation aids. We were thankful for the AIS system that identifies commercial ships giving their location, speed and course to allow us to keep clear of them. 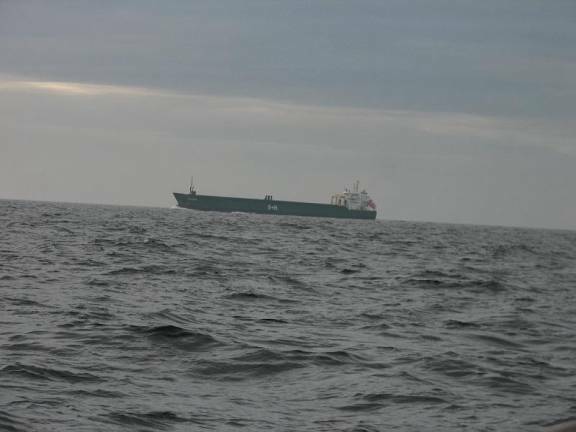 Outside IJmuiden they seemed “stacked” at anchor waiting for pilots to get them into port. There are shipping lanes but the large freighters prefer not to use them so we never know where they are going yet the coast guard delights in yelling at small boats for being in the way of coasters. The first order of business once we were safely tied at the marina dock was to check in with Customs & Immigration. The marina office had a form we completed and put in a box. There were no passport stamps, no officials to inspect the boat and/or us. 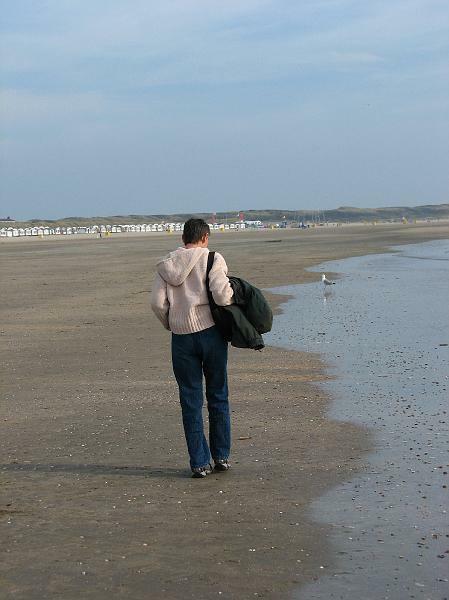 The broad beaches in IJmuiden are popular with the Dutch for surfing, paragliding, wind-driven beach buggies, and sunbathing. Because the country is so low, and the tidal range about 10 feet, the beach becomes very wide at low tide, exposing thousands of razor clam shells. Temporary beach houses are erected in April and moved “to some parking lot” in October. These structures do not have plumbing. There are public bathhouses and toilets for the inhabitants to use. Every one of them seems occupied, especially since the two-week school holiday began the day we arrived. 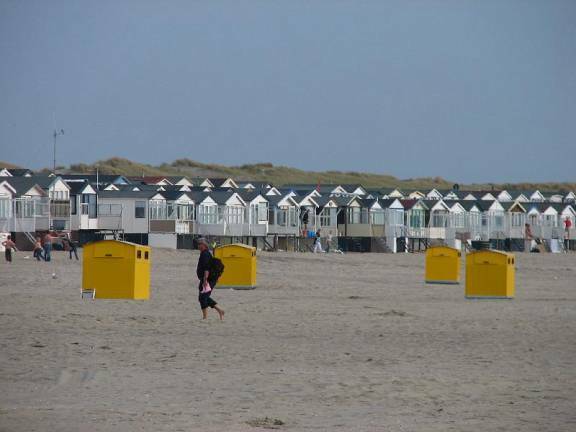 The urban development of white beach houses is only in place during the summer, the yellow boxes are for garbage. It was a sunny day, the first warm day we had experienced so far, and young people were swimming in the harbour. 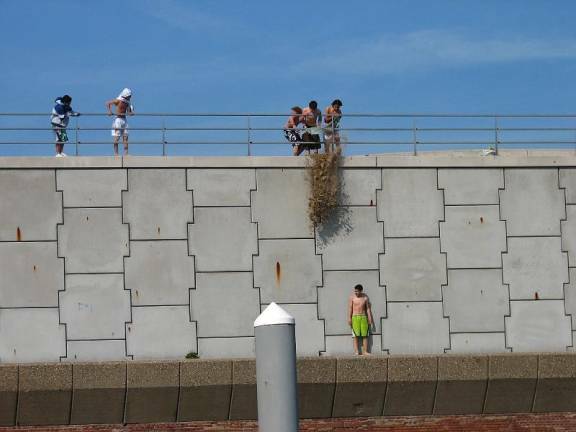 The usual teen-age intimidation (a bucket of sand being dropped on his head from “friends” above) encouraged jumping into the water. Bombs away … the fellow in green is standing 20 feet above the water on a small ledge. The Nordseekanal connects the North Sea with the IJsselmeer / Markenmeer (formerly the Zuiderzee before the huge dykes (Afsluiitdyfk) were constructed at the north end of Holland in 1932). 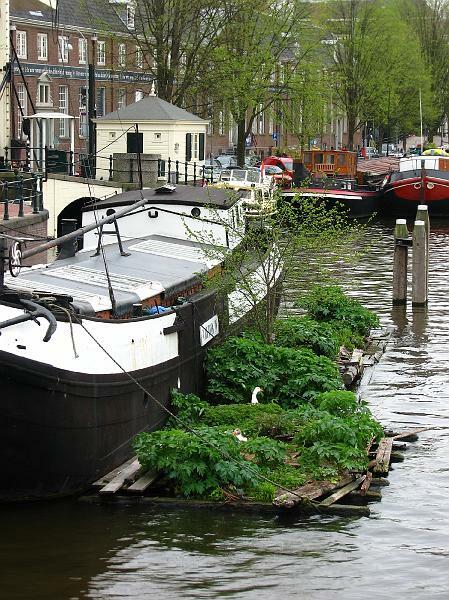 A lock is at each end of the canal, and Amsterdam lies inland, just a few miles from the Markenmeer. The canal was not nearly as busy as we had expected, perhaps because we traversed it on Sunday. 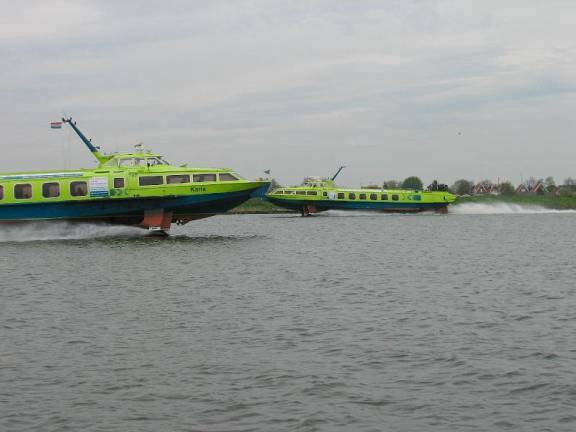 High-speed hydrofoil ferries were constant companions. 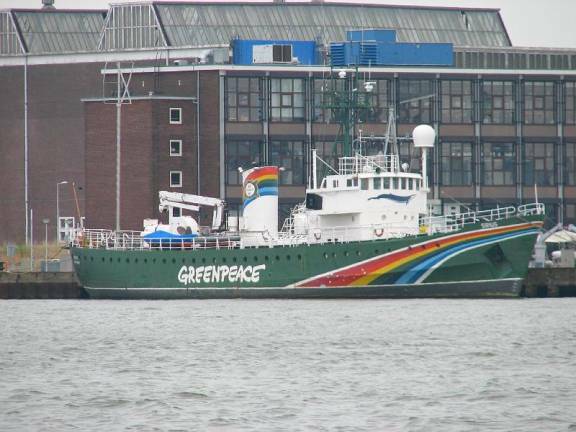 Greenpeace at rest … the whalers aren’t. Some large river barges passed us, and a Greenpeace boat was docked with no activity to suggest they were preparing for another whale harvesting protest voyage..
Modern windmills were constant companions. 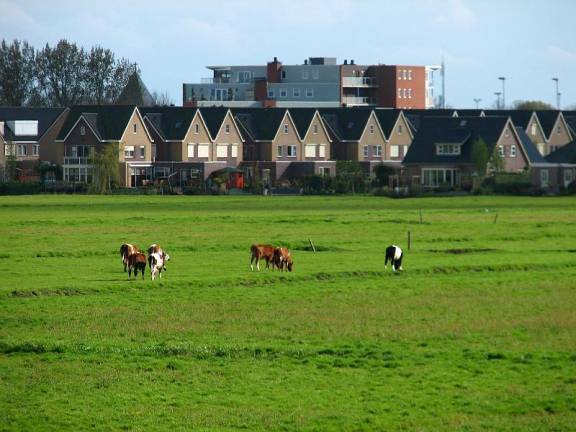 We wonder if anyone has studied the impact of the large concentration of windmills in the Netherlands are the weather; opponents of wind farms use the weather impact of the farms as their main argument. 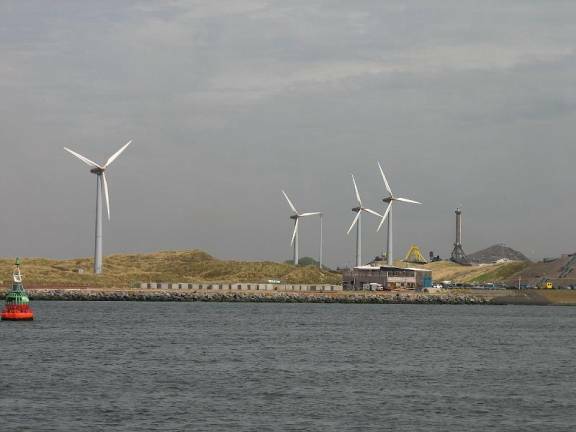 The number of windmills in Holland put Canada’s wind generation schemes to shame. They are on at all times and winds unlike the one at Toronto’s CNE which only tries to run when there is no wind … I guess they don’t have cash for maintenance. 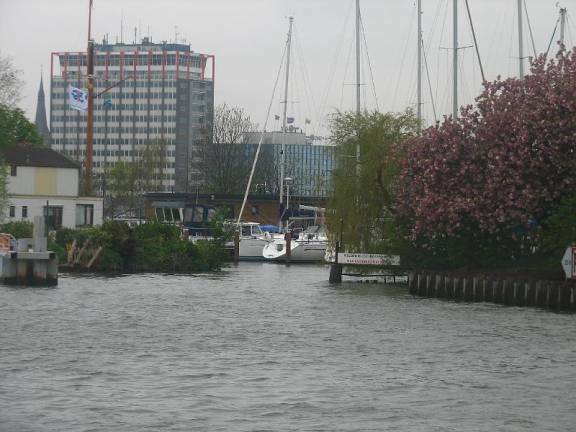 When we arrived in Amsterdam we identified Sixhaven Yachthaven, but finding the entrance was not easy. After circling the entrance 4 times, we finally ventured into a small yacht club that was full of rafted boats. A willow tree guards the entrance. We had to wait at the entrance while boats jockeyed around, and drifted into the willow. Twigs and leaves crashed to our decks and into the dinghy … poor tree. The poor willow didn’t have a chance against our mizzen mast. We enjoyed watching a nesting pair of coots, and rose-ringed parakeets. 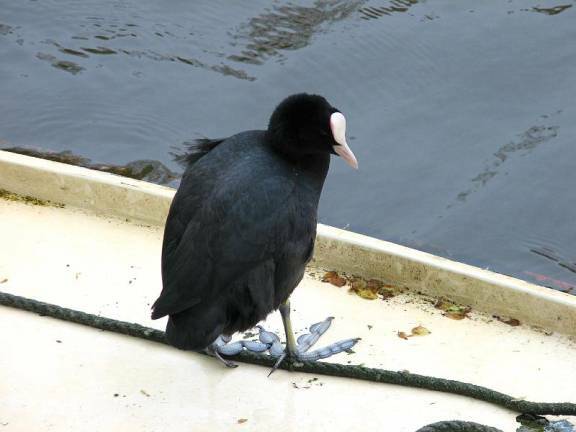 A Coot … note the feet … the bird can swim, dive and doesn’t waddle like a duck. 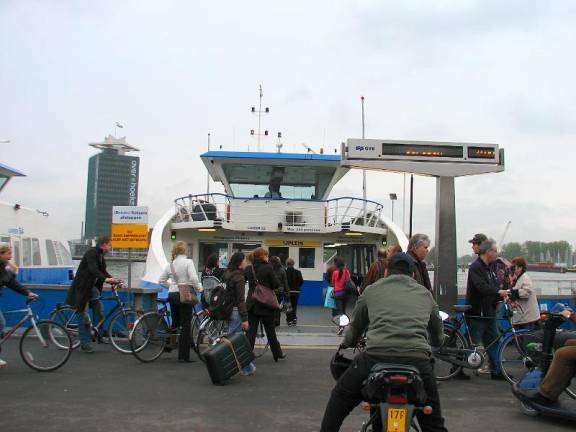 Sixhaven Yachthaven ideal for getting into Amsterdam’s Central Station via a free ferry for passengers, cyclists and motor scooters. A free ride to town … the TTC should do the same with the Island ferries. 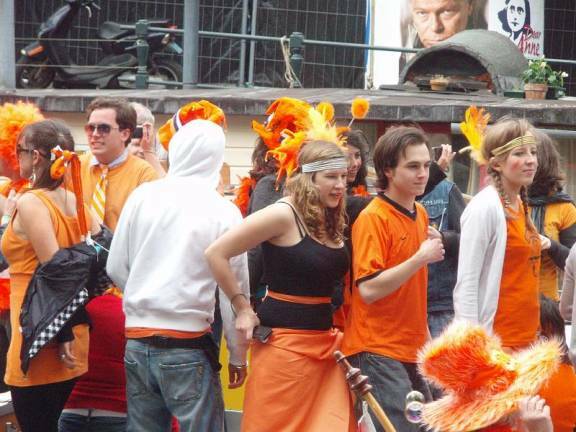 We spent two days walking through the canals of the city, and spending Queen’s Day (April 30) with and orange-festooned crowds in Amsterdam. 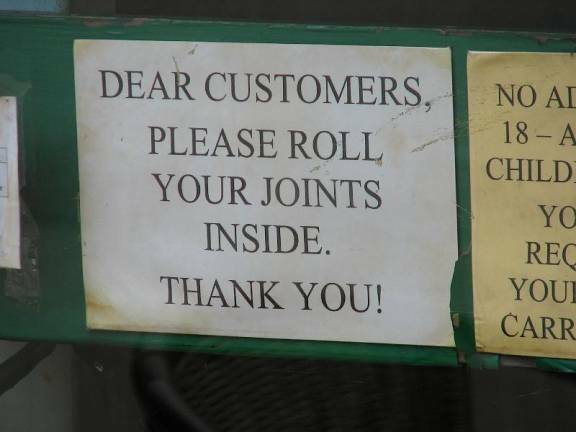 Café in the Red Light District: … permissive to a point. 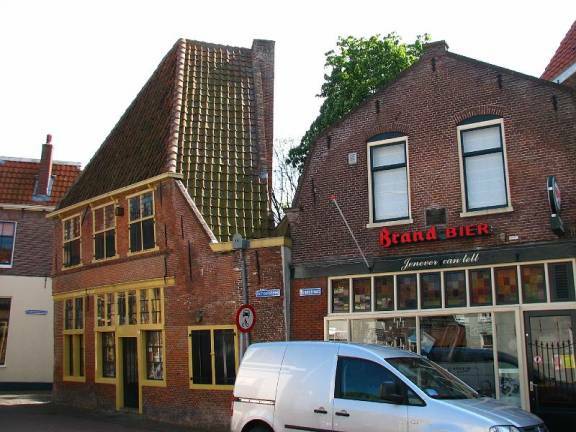 Last year Edam celebrated its 650th birthday. 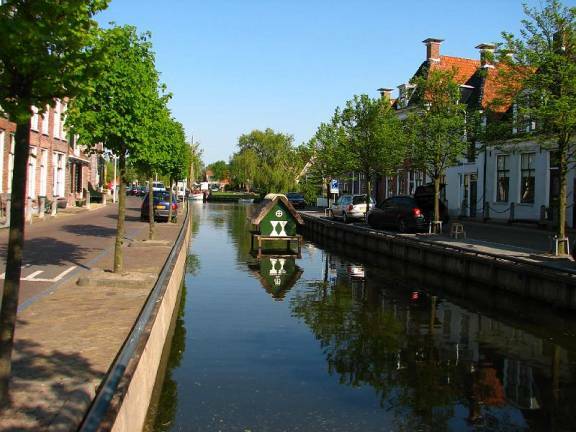 It is a village of canals and farmland. We had not seen many cows to this point and wondered where the milk for cheese came from. When we got off Pilgrim and walked across the dyke into town, we were amazed to look DOWN on the fields from the dyke. 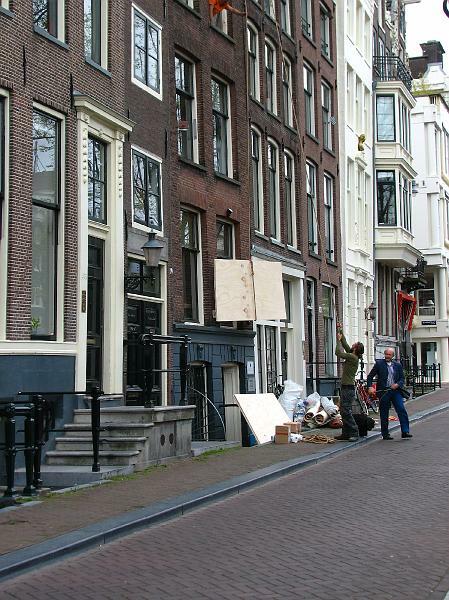 Most people who live in Edam either work in Amsterdam (a 20 minute train ride away) or are retired. 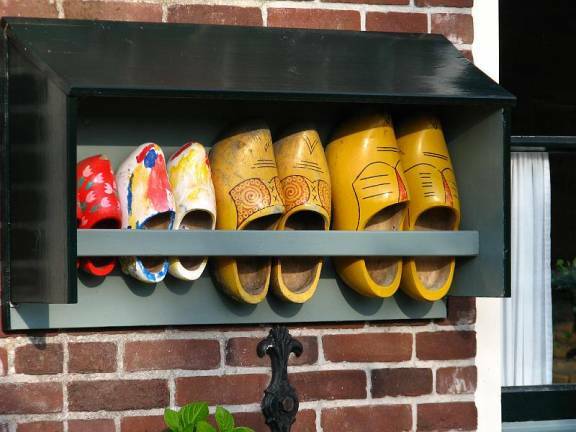 Many of the houses keep the old farm look with stands for wooden shoes next to the door. Contented cows, goats and sheep. Pastoral scene. 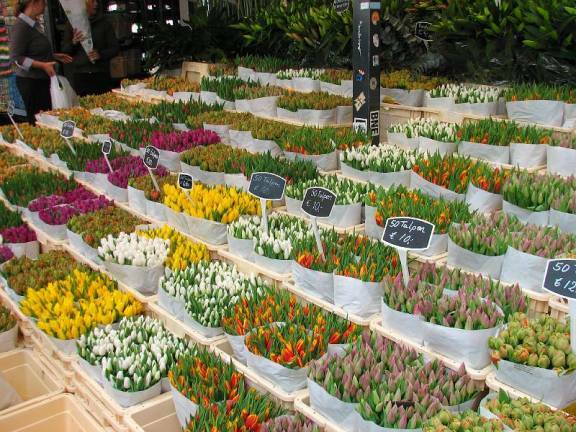 The farmland seems to be run by agri-business rather than family farms. 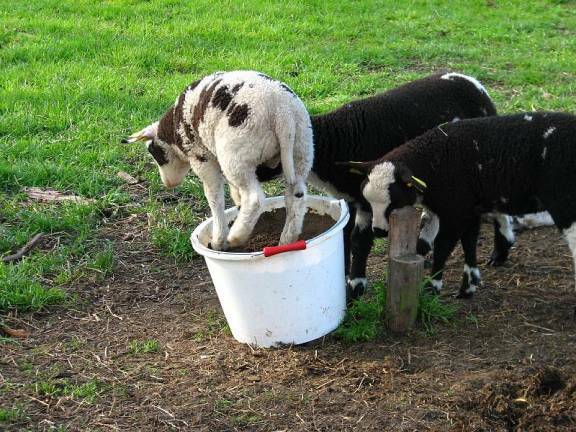 This little guy decided he was king of the castle or at least the feed bucket. 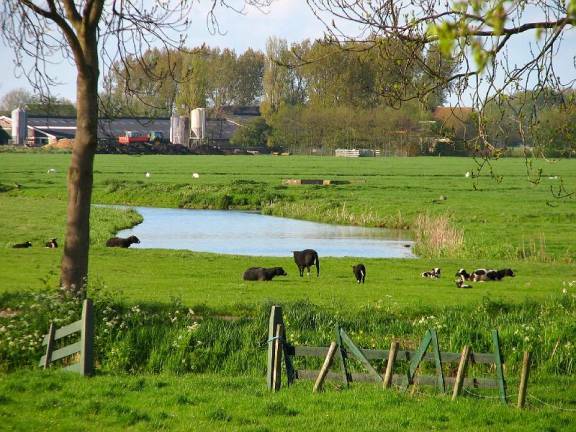 Oddly enough, we saw more sheep than cows in Holland, renowned for it cow cheese, with hardly any lamb in the supermarkets. Fishing or is it eeling? 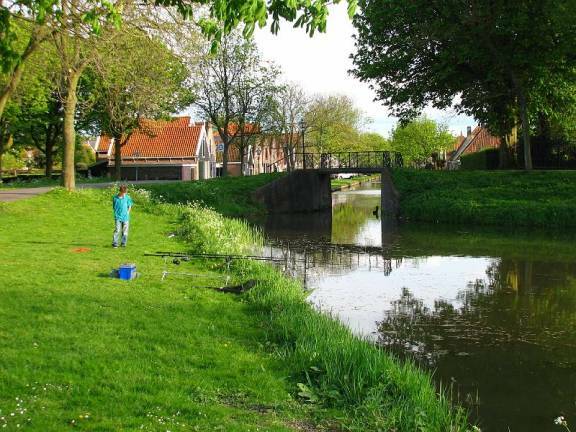 There is hardly any fishing done in the IJsselmeer, but folk fish for eels in the canals using long poles. 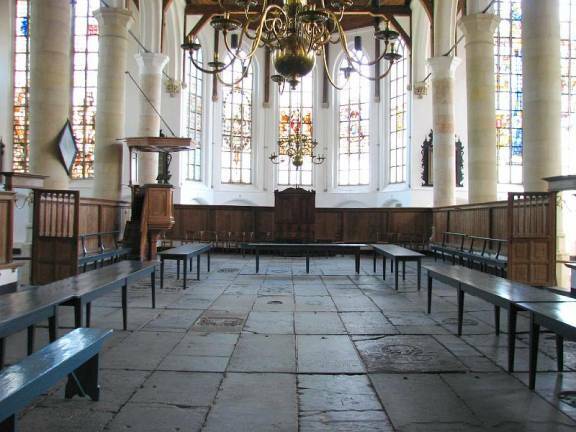 The Grote Kerke in Edam is stark; it was re-built after the “Alteration” when Holland changed from being a Roman Catholic country to being Protestant. 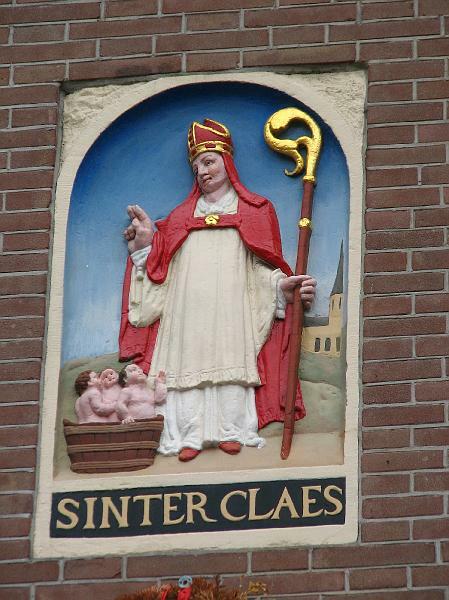 A bit stoic even for hell, fire and brimstone sermons. The basic floor plan is for a Roman Catholic cathedral, but the church is devoid of statues and decoration. Even the fine stained glass windows depict guilds and towns who donated the funds for them rather than religious scenes. The church is still used, but only in the summer. In the winter it is too cold since it has no heating. 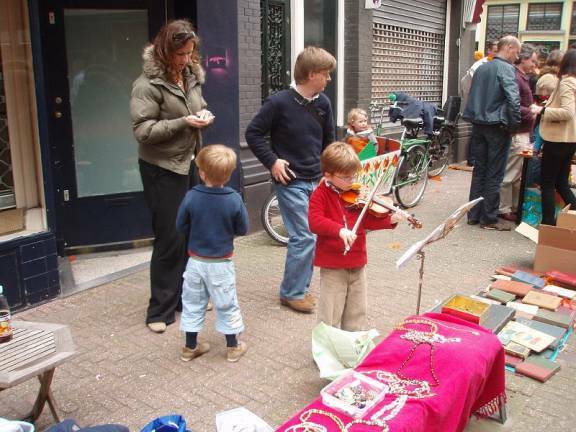 The Dutch schools were closed for 2 weeks while we were there, so especially on the weekends, families were out on their boats and the harbours were crowded. 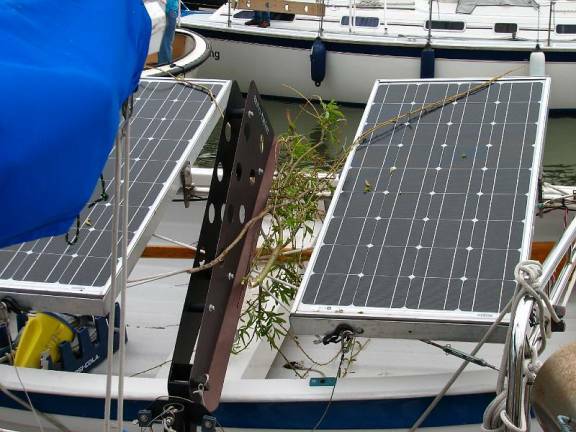 In Hoorne, we could anchor inside the breakwall without charge. Many boats anchored only for the day, but there were always 2 or 3 other boats with us overnight. Most visitors went to one of the two marinas or along the canal walls, rafting 3-deep. 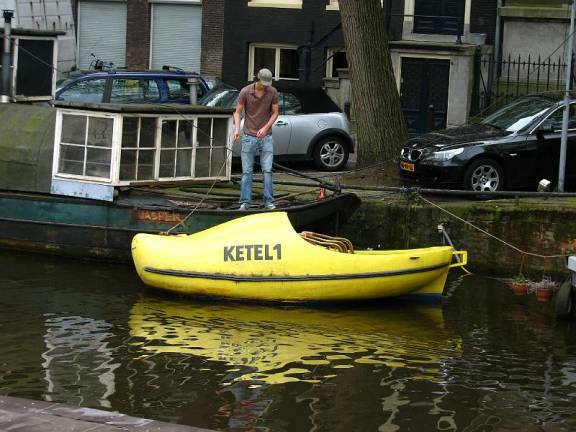 A most officious harbourmaster shepherded boats to spots he deemed appropriate for them. Maneuvering room was tight. Wonder if this guy had any problem getting logo copyright approval? 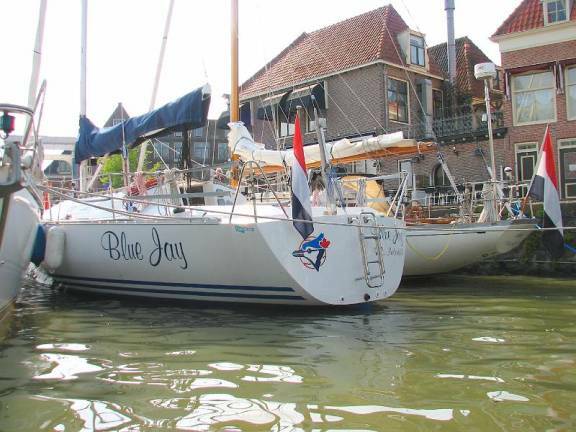 One boat with a Netherlands flag was called “Blue Jay” and had the Toronto Blue Jay’s logo painted on its transom. 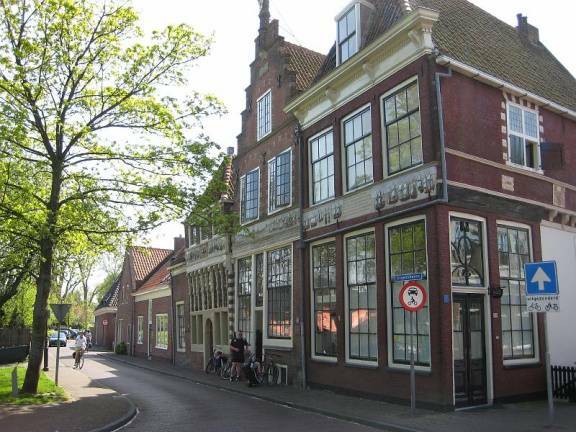 Hoorne used to be an important port for the Dutch East India Trading Company in the 17th century and some of the fine houses for prosperous sea captains date from that period. Others like to put up a big front with little to show in the back where no looks anyway. 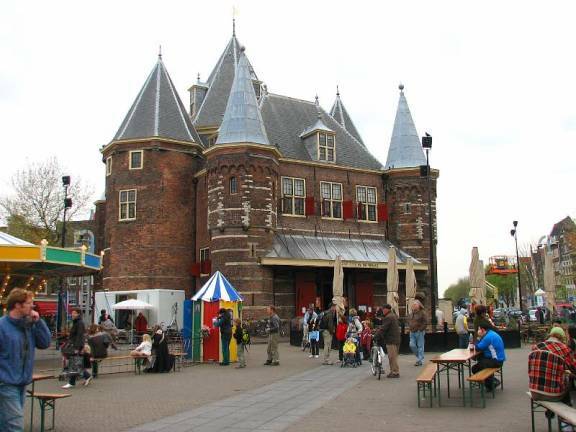 The city has its main square and Den Waag where goods were brought and weighed. 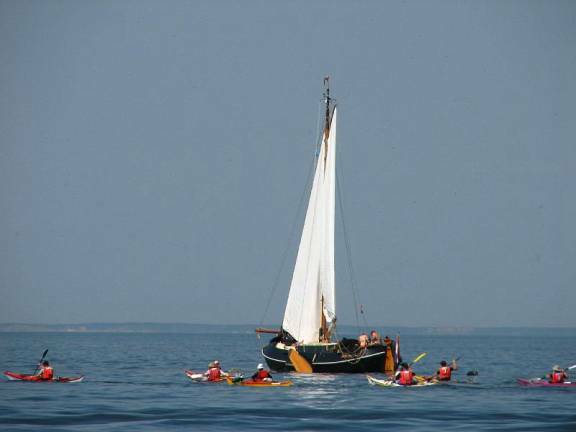 There are about 20 sailing barges (ketch rig) that take folks out for a half-day excursion. The famous wooden dock where they normally moor is being rebuilt right under the clock tower. 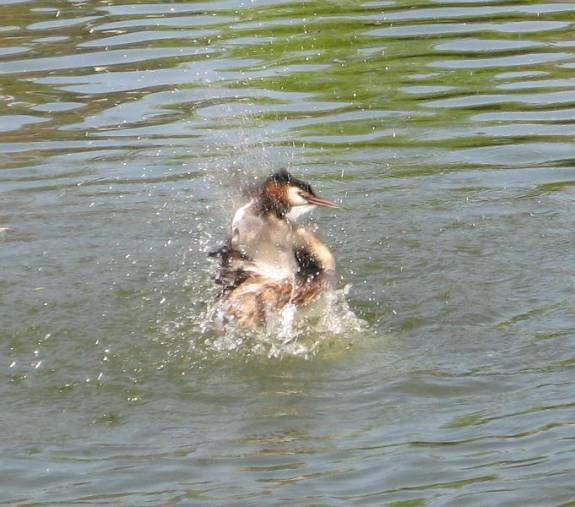 A Great Crested Grebe taking a bath … quite a flurry of activity …guess I would act the same if someone were watching me. We were fascinated with the Great Crested Grebes, our first encounter with them. 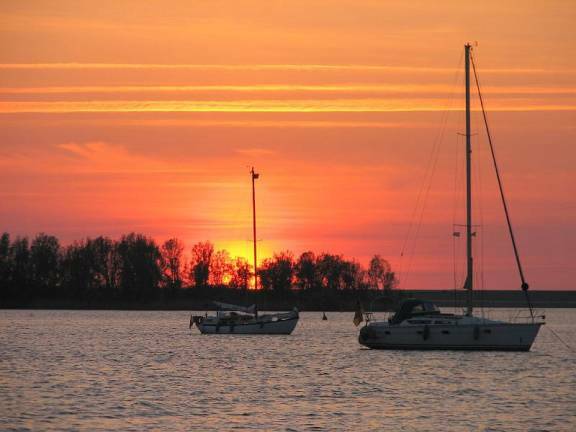 Hoorne is one of the regular stops for IJsselmeer cruise boats. 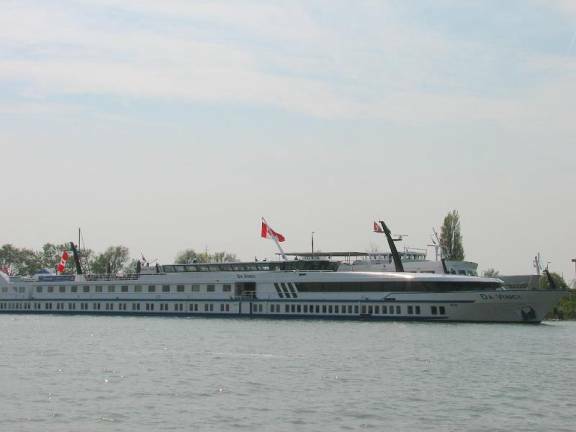 These are shallow-draft, 2 or 3 decks high, and very long boats to accommodate 100-140 passengers and crew. They have multiple side thrusters to maneuver is tight quarters. We thought this was a nice welcome for us … turns out there had just been a bunch of Canadian tourists on the cruise. When we arrived a cruise ship was draped with Canadian flags since a Canadian-run tour had just been completed . We also saw a Red Cross cruise ship which takes chronically ill patients on cruises. 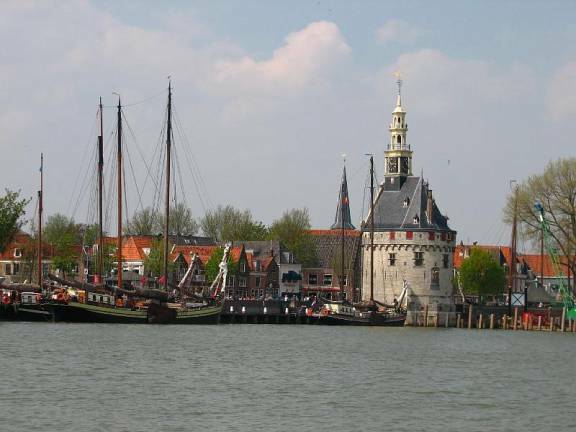 Hoorn was hometown for Willem Schouten who named the tip of South America Cape Horn after his birthplace. A long dyke separates the Markelmeer in the south from the IJsselmeer in the north (although many call both sections of the old Zuider Zee IJsselmeer), and we had to go through a lock to get to Enkuizen. 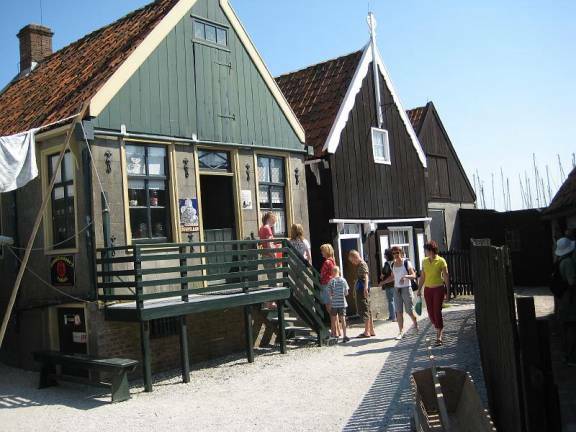 We spent a full day at the ZuiderZee Museum, a large outdoor complex of building that had been moved from many different villages on the Zuider Zee when the construction of the dykes changed the fishing and shipping economy of the area. 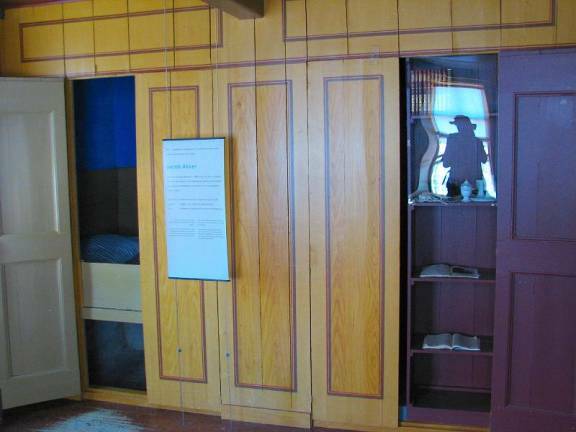 A collection of fisherman’s houses saved from redevelopment and moved to the museum. 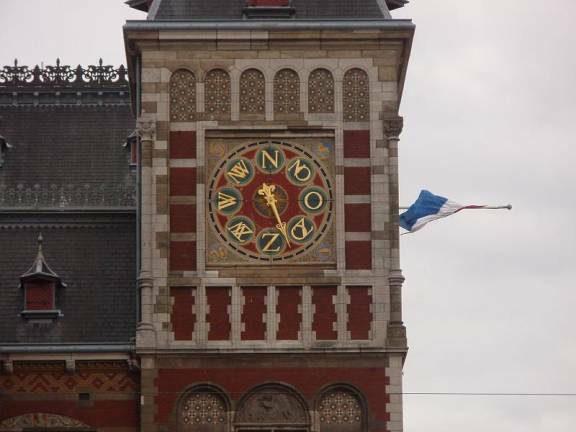 The museum was fascinating, but we were somewhat disappointed that most of the detailed information was in Dutch only. 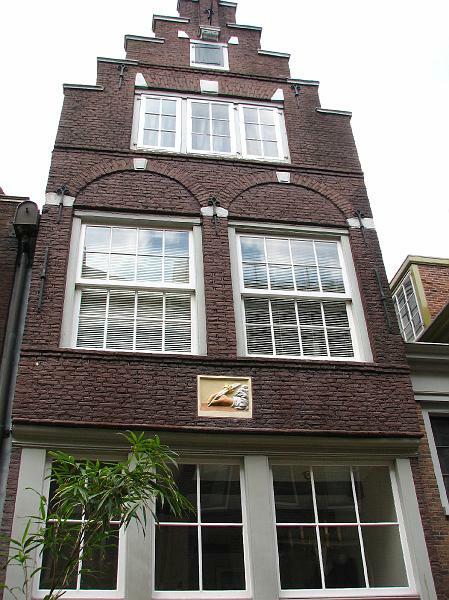 The museum was children-friendly with hands-on rope making, wooden shoe boats to make, and punting on the canals. 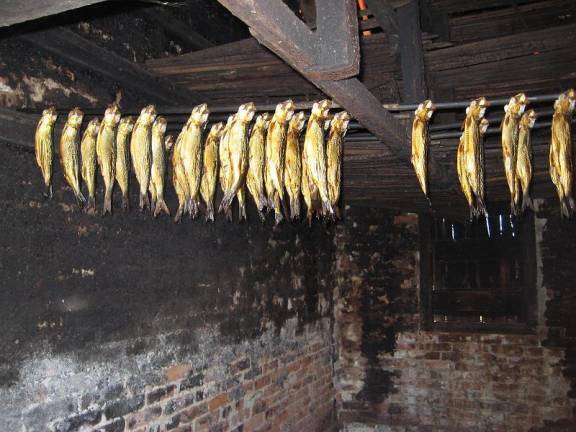 A fish-smoking shack that was used commercially until recently. Some of the fishing shacks were set up to show how herring and eels were smoked, and we enjoyed some smoked eel for lunch. This was the only English sign in the whole museum outside of the Jewish house signage. It basically condemns US tourist unguided generosity as a destructive influence on rural communities. The same has happened throughout the world when US tourists invade. 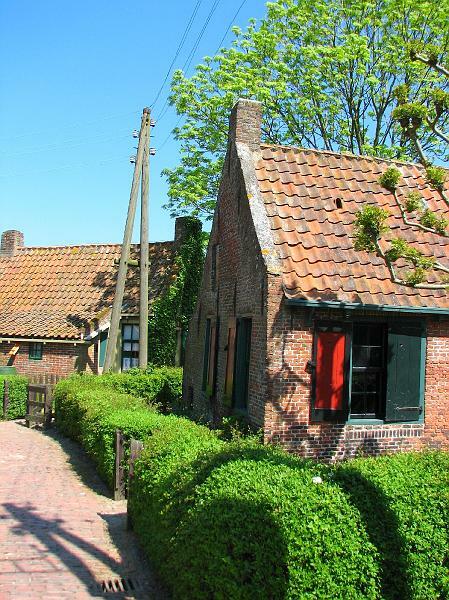 One of the towns in the south, Marken, used to be on an island and was quite remote, maintaining old dress and customs. 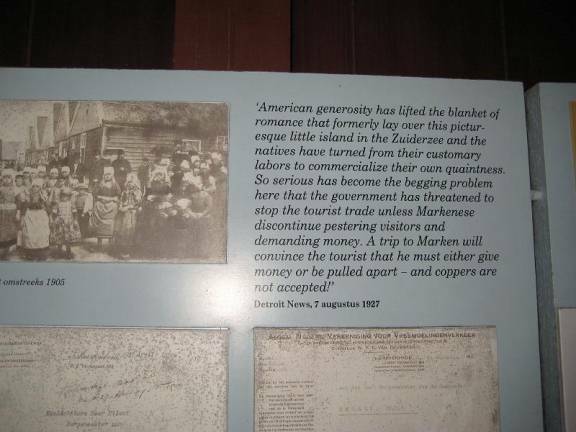 Evidently in the early 20th century American tourists flooded the place, giving money to the poor inhabitants, almost devastating the economy. 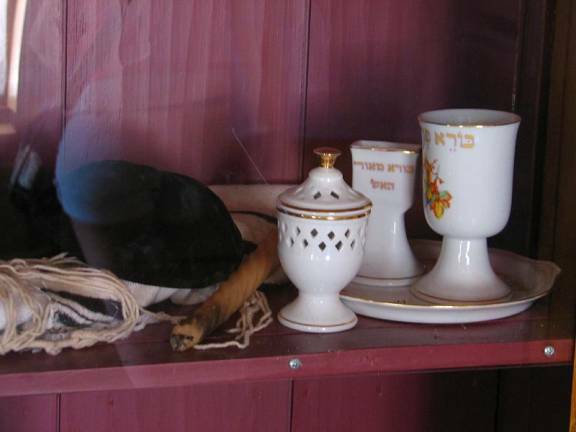 One restored home was Heiman Akker’s, a Jewish brush-maker from Enkhuisen. 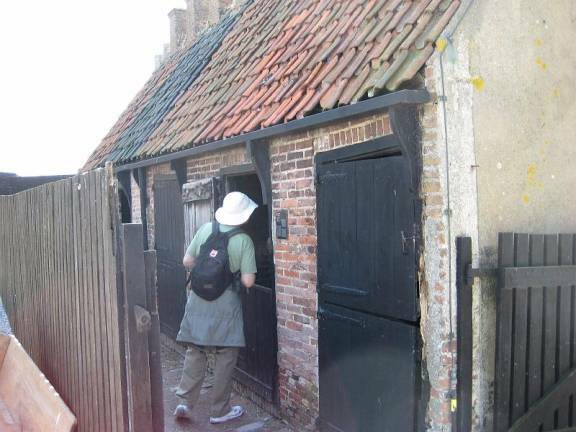 It was the one house that had as much detailed descriptions in English as in Dutch. The marina was nestled in amongst a reed-bed. There were many ducks and Great Crested Grebes, gnats and barn swallows. Barn Swallow came to visit and collect bugs from the deck. 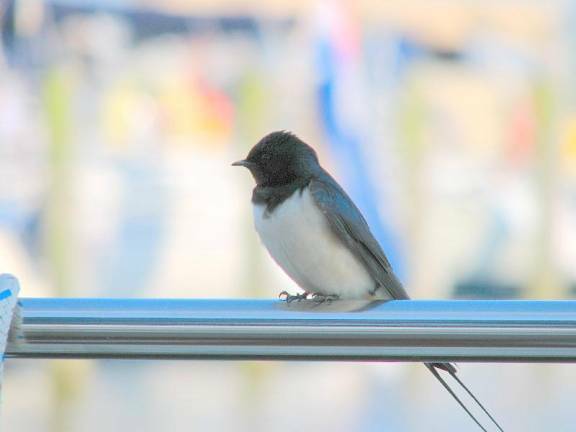 One swallow landed on our lifeline, and we remembered the swallow that hitched a ride with us during the storm southwest of Bermuda just one year ago. 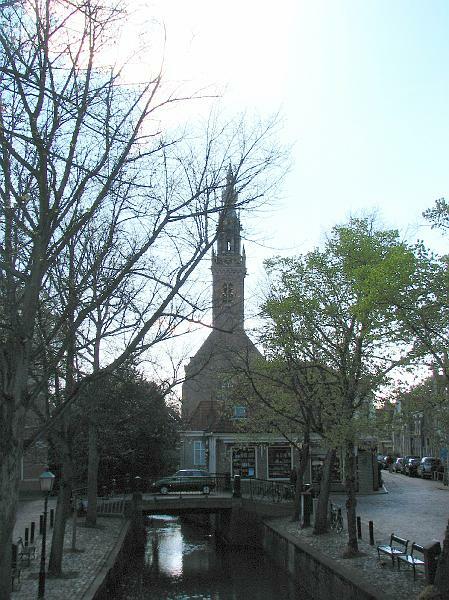 Stavoren is a town on the east side of the IJsselmeer. It had a beach and with the east winds, we could anchor for the night. 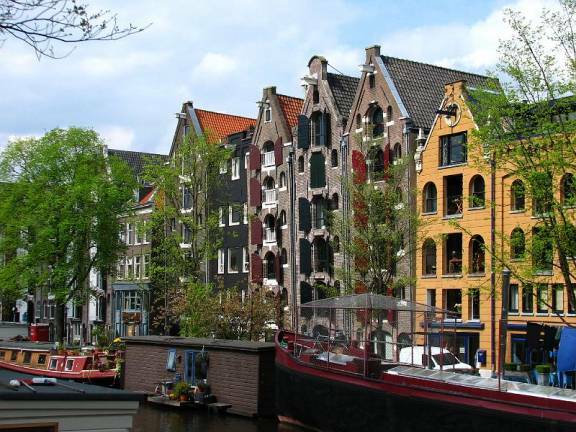 We had read that with all the canals, Holland is a great place for bugs. Even though it was cool for most of our time in the Netherlands, we were emendated with bugs through much of our trip. The surface of the water was often covered with bug larvae or carcasses. The lee side of our sails were covered with black fly-like bugs. Luckily, most of the bugs were not biters. 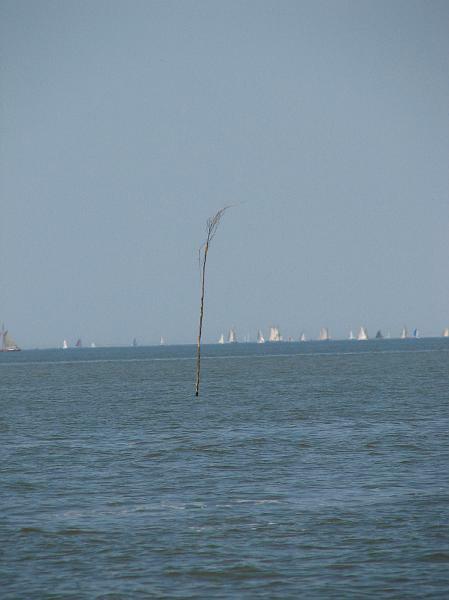 The water in the IJsselmeer is light green/brown and shallow, less than 20 feet (7 m). 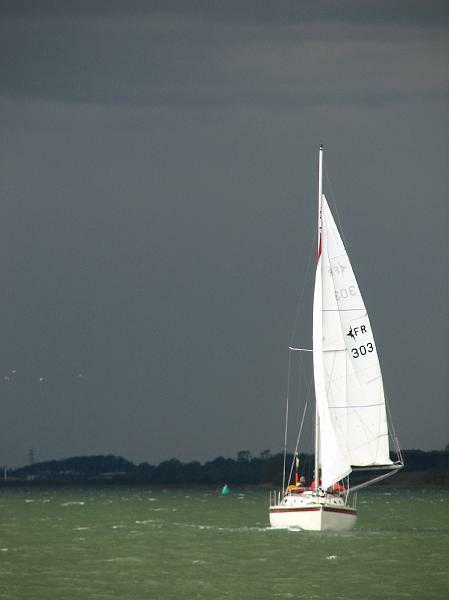 We enjoyed sailing without tides and currents, but did not like the water depth or colour. A warm day brought out shorts & T-shirts, mosquitoes and frogs in a nearby pond. It seemed there were as many Germans as Dutch in this marina. 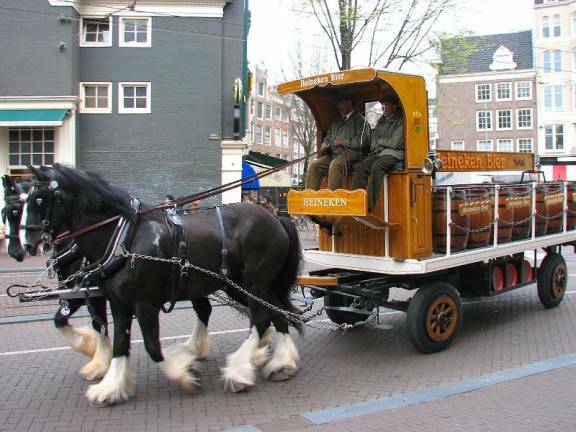 It is understandable that the Germans who live in the west would prefer to keep their boats in Holland since the German coast along the North Sea is not amenable to sail or power boats and cruising. Makkum was a prosperous fishing town before the dykes were built, and now has developed major pleasure boating companies; it is not a tourist centre. A sand sculptor to celebrate (?) The Queens visit. 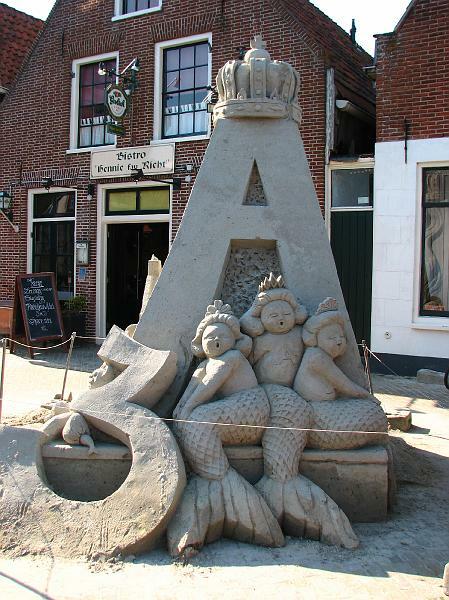 The mermaids are a symbol for the town. 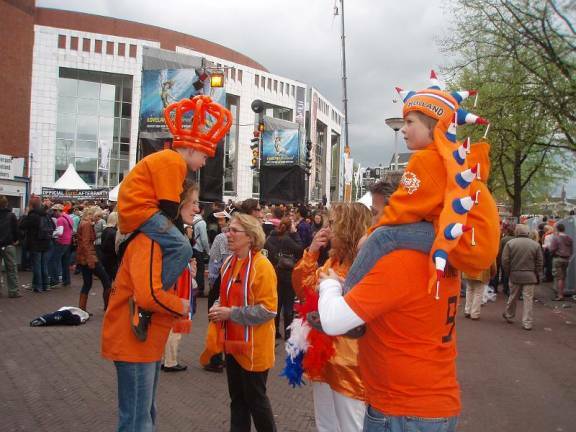 Queen Beatrix had spent Queen’s Day in Makkum, so it was still decorated to celebrate her presence. Yes, the ducks have their own housing development right in the middle of town. Many of the houses were decorated with beautiful ceramic tiles, and a duck nesting house graced the middle of the main canal. Makkum was the furthest north port on the IJsselmeer. 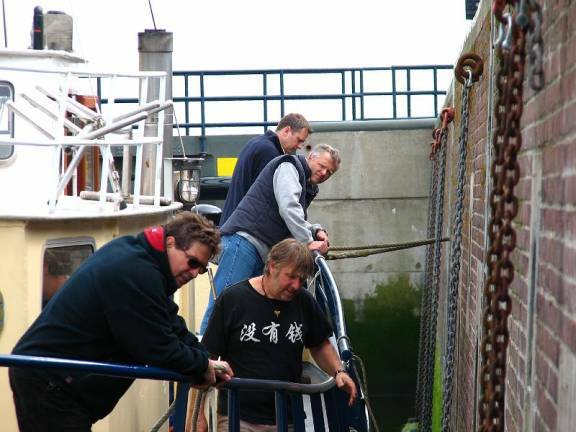 We went through the lock and were back into tidal, salty water, the Wadenzee. It was a long weekend in the Netherlands and it seemed that everyone that had a boat decided to go out into the Waddenzee to the West Friesian Islands. 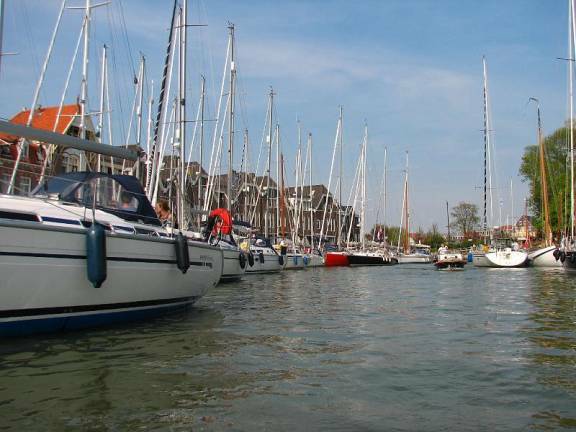 The lock was jam-packed and the parade of boats in the Waddenzee, which is really a huge sandflat with buoyed channels. We do not know why the Dutch decided to build the dyke that forms the IJsselmeer south of the Waddenzee. They could have reclaimed more land if they had dyked between the Friesian Islands. 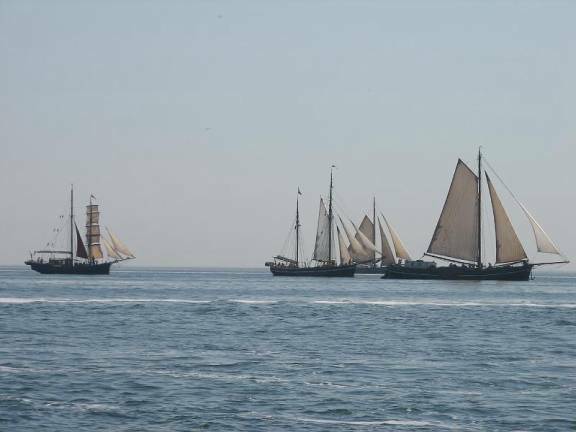 We joined the parade, sailing when the wind allowed and motoring most of the way to Terschelling. 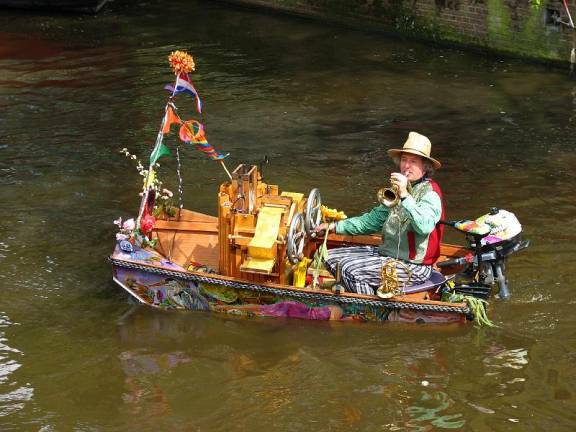 This, dear friends, is a navigational mark … government cutbacks? 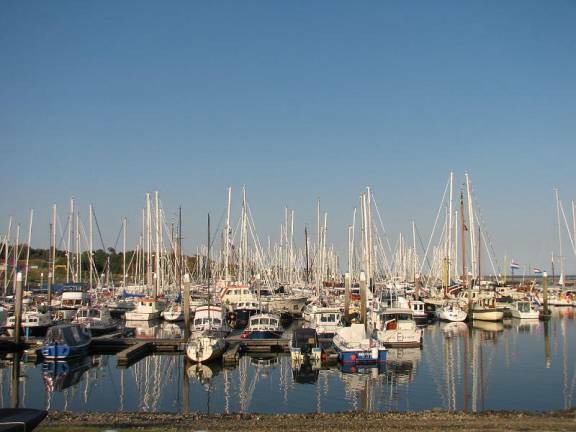 We had planned on stopping at Vlieland Island, but the marina was closed for repairs and anchoring was not an option. Had we been a crow, we would have traveled much less than the 30-mile meandering channel. .
A fine collection of old sailing rigs. Only thing missing are the smoke rings from the guns. 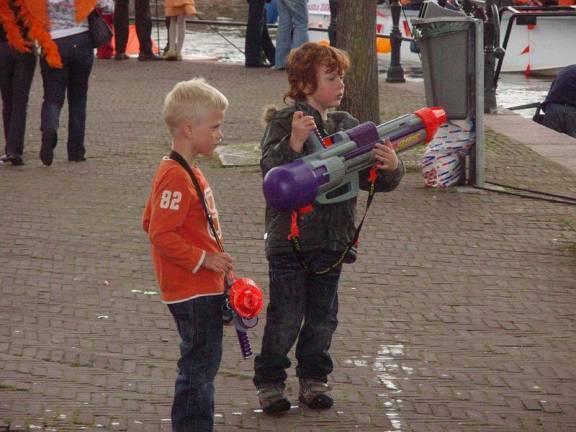 The marina from Hell. Rafted 5 deep … no services … office hours from 9 to 5. The inside boats on our raft wanted to leave at 7AM the next morning, so we also planned an early departure. The harbour office was closed and there were no signs in English to let us know how to pay our harbour fees. We checked with a Netherlands boat beside us that was familiar with the port and they told us that if you arrive and leave before the office is open paying is optional. As we departed the harbour, the harbourmaster came speeding out after us in his inflatable yelling at us that we were breaking international law by not paying our fee. 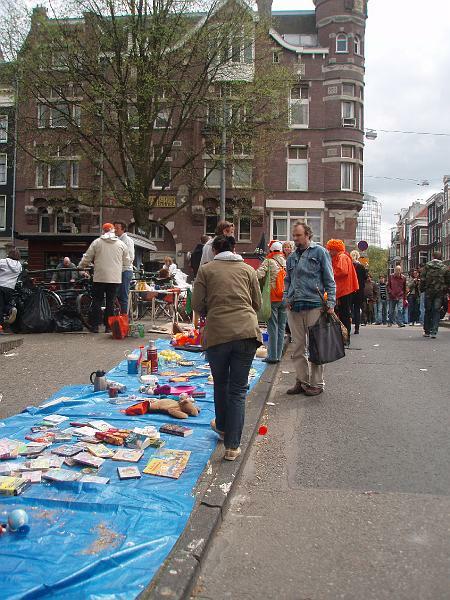 We tried to explain we had tried to pay, but could not figure out the fee or how to pay with no signage except in Dutch. We asked him how much we owed and he said, “€30” … about $50, and almost twice as expensive as any other marina, including Amsterdam. It was rather awkward to ask for a receipt, and we think the harbourmaster pocketed the fee for himself. Leaving Terschelling we had to follow the meandering channels out the Waddenzee to the North Sea, which took us 3 hours before we could head east to Germany. 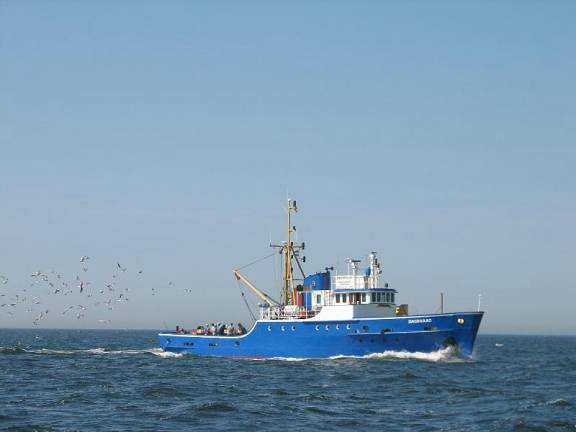 The fishing trawler is a common sight … easy to spot from a distance due to the seagulls. By early afternoon we realized it would be dark before we arrived at Borkum, the western-most of the German East Friesian Islands. 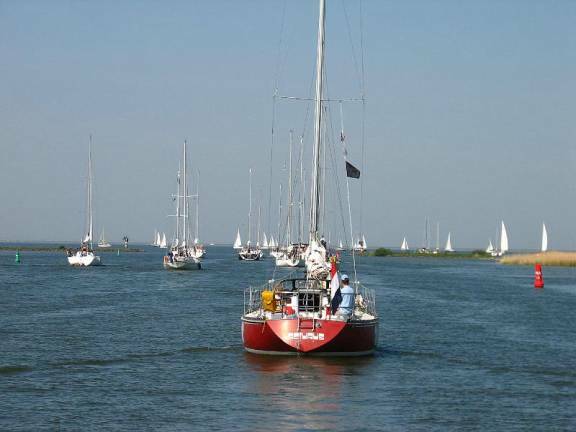 We decided to find an anchorage behind one of the Dutch Friesian Islands, Schiermonnikoog. We followed the meandering channel for 2 hours and discovered that there was no protection from the northeast wind by the island or the extensive sand flats. 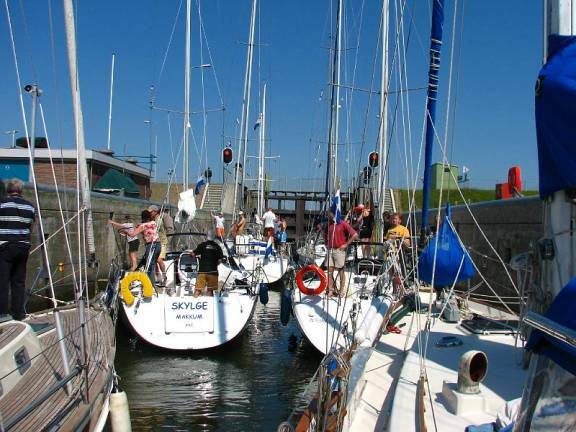 The good news was that a protected anchorage was just one lock away in Lauwersoog. We managed to get into the lock, but with some problems. The lock was not ready for us, the wind and current were sweeping us into the lock, and there was no place to land the boat to wait for the lock. Our poor dinghy (on davits on the stern of Pilgrim) acted as a fender for Pilgrim and a post, crushing the port bow of the dinghy. Once in the harbour and anchored, we decided to stay a day to assess the damage and repair what we could. We ended up staying 5 days; 3 to do repairs, then 2 more waiting for the NE winds to calm down. Safely at anchor and ready to repair the lock damage. 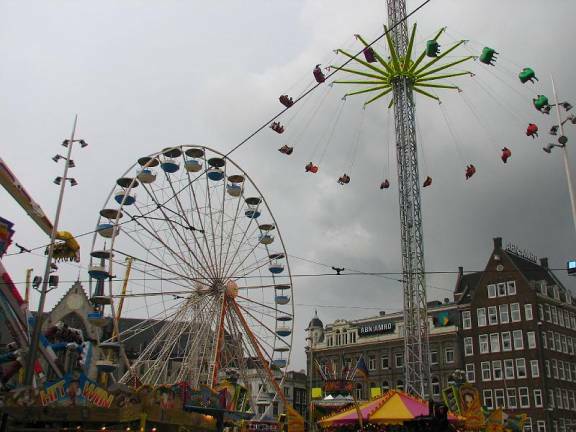 Our time in Holland was short … less than a month. 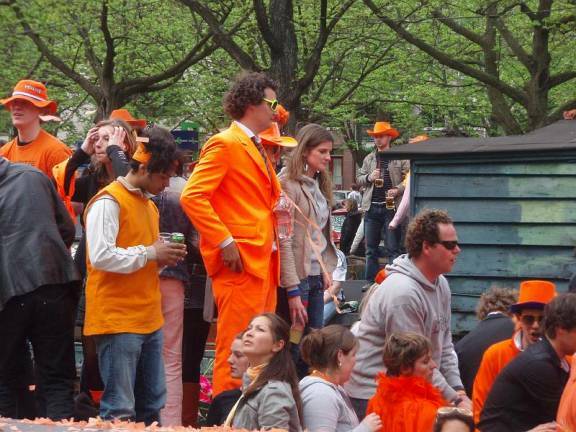 Our overall impression is that the Dutch are either not curious or shy about foreigners. Seldom were we approached to find out about our travels. 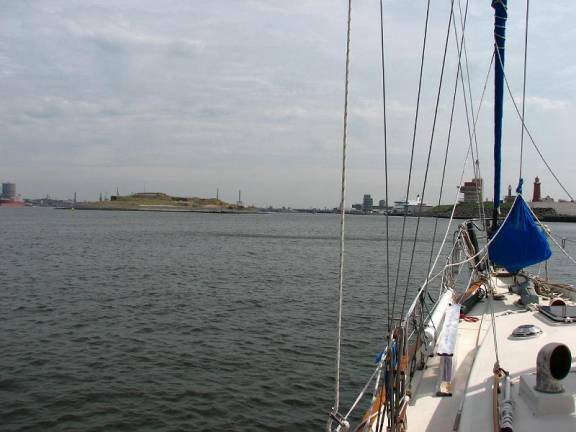 We saw no other boats from North America, England, Belgium or France, and only a handful from the Scandinavian countries, so we must have “stood out.” Once we got to Germany, the Dutch seemed much more friendly, perhaps because they were no longer “at home”.